Around the corner from Toronto's First Post Office is the ultimate in downtown living. Post House Condominium. Chic, ultra-modern residences in a storied heritage setting. A stylish new urban habitat steps from the St. Lawrence Market. Minutes from the Distillery District. And a million miles away from conventional condo thinking. 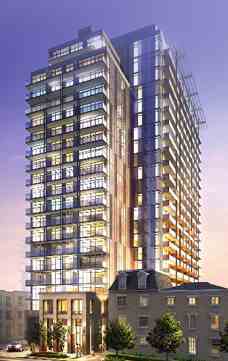 Post House Condominium is a new condo project by Alterra currently in preconstruction at 105 George Street in Toronto. The project is scheduled for completion in 2013. The project has a total of 278 units. Around the corner from Toronto's First Post Office is the ultimate in downtown living Post House Condominium. Chic, ultra-modern residences in a storied heritage setting. A stylish new urban habitat steps from the St. Lawrence Market. Minutes from the Historic Distillery Districts and a million miles away from conventional condo thinking. A dramatic entrance and arrival area welcomes you and your guests to Post House. In the lobby. a 24-hour concierge waits to greet you and your guests or accept your parcels. While many of life's pleasures surround you at Post House. you needn't even step out of your building to enjoy yourself. For your relaxation and leisure time. Post House offers residents a private recreation centre featuring a well-equipped exercise room and yoga/Pilates studio. 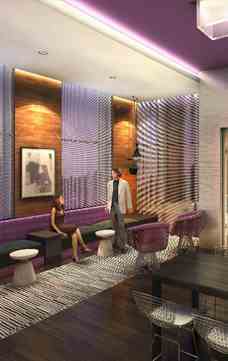 A multi-purpose lounge and party room with Media TV Centre. Kitchen and dining room. Old Town Toronto is the hot new destination, minutes from the city's financial and entertainment districts. The St. Lowrence Market has beckoned shoppers for over two centuries. The bells of St James Cathedrol still ring out every Sunday morning. above its Victorian garden pork. Here you‘re surrounded by it all. in on urban playground that’s open 24/7 and all just o quick stroll away from both the King and Union subway stations. ln the centre of historic Old Town Toronto. close to the hub of today’s downtown. Sit three buildings that hove served as Toronto's social centre. City Hall and marketplace throughout the City‘s history. Established in 1803. the St. Lowrence Market encompasses over T20 specialty merchants and vendors at the corner of Front and Jarvis Streets. At what Food & wine magazine has declared ‘one of the 25 best markets In the world. what better way to spend o Saturday morning than savouring the sights. sounds and smells of the Market?